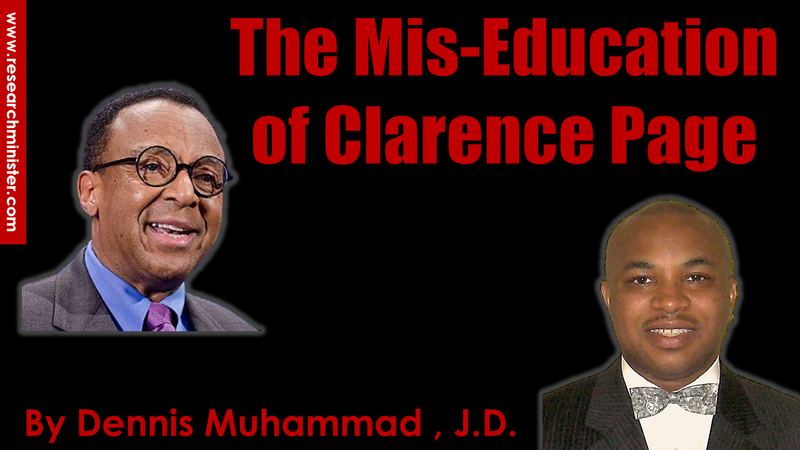 The Mis-Education of Clarence Page by Dennis Muhammad, J.D. I am a trained lawyer, an educator by trade and one of those bowtied F.O.I. that patrol tough neighborhoods and run off drug dealers. I have been a student of the Honorable Minister Louis Farrakhan for twenty-seven years. 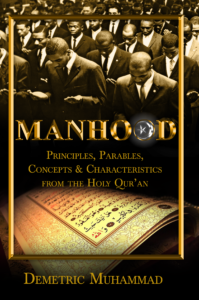 I have studied Minister Farrakhan’s words, analyzed his motives and examined his works. I have also admired and studied many other historical leaders and figures and the effect of their work in the Black community. The Honorable Louis Farrakhan has been easiest of them all to stand with and defend. I am a beneficiary of Minister Farrakhan’s Teachings and Work, but I’m always looking for critiques to understand different perspectives and viewpoints of his work and mission. When I read articles like yours about Minister Farrakhan, I often wonder what I am missing that is not making my analysis of him and his works more objective. I think it may be that I’m more concerned about my people and Black self-preservation than capitulating to false charges and allegations of bigotry and anti-Semitism. I read your article addressing the question of why black politicians have a difficult time denouncing the Honorable Louis Farrakhan’s for his alleged bigoted and anti-Semitic comments. Denounce means to publicly condemn as wrong or evil. What can any Black politician prove that Minister Farrakhan has said or done to Jews that is wrong or evil? Name one Jewish person whose health, interests, rights or needs have been violated by Minister Louis Farrakhan or any Nation of Islam member? Minister Farrakhan is denouncing Jewish actions against Blacks, particularly, the control some Jewish people and institutions possess over black entertainers, athletes, politicians, preachers, and journalists like yourself. It’s very difficult for Black politicians to denounce someone who is denouncing actions that ill-effect their ability to legislate for the best interests of their people and constituents. Those few feeble minded Black politicians that are influenced by Jewish money, however, are forced to denounce Minister Farrakhan, not because of his statements, but because of Jewish control over their political careers and livelihood. Minister Farrakhan has challenged Jewish writers and apologists who accuse him of anti-Semitism for three decades to prove him wrong or his words to be lies. It is not enough to call him a bigot and anti-Semite, you have to prove what you charge. First let me help you understand the differences between Minister Farrakhan and Donald Trump as well as the differences between their base supporters. Trump is proven to be a compulsive and calculated liar. He is a businessman, Reality TV host, and controversial president/politician. Mr. Trump’s desire is to make America a great racist nation again. Mr. Trump is not a reformer or transformer of life. He does not have a mission of redemption and restoration of a destroyed people. His message appeals to a base of white Americans that wants America to be what was in the past. No one has proven Minister Farrakhan to be a liar. He is beyond dogmatic teaching and race-baiting rhetoric. Minister Farrakhan is a transformer of human life. To compare the two men proves you have very little interest in the truth and the real conflict between Minister Farrakhan and his Jewish opposers. You don’t understand Minister Farrakhan and the power that upholds him. He comes in the tradition of prophets and messengers that give clear warnings to governments and nations. Minister Louis Farrakhan is a redeemer and civilizer of Black people. He has a specific mission to resurrect and transform the life of Blacks from the condition of 400 years of slavery and oppression. That mission also includes reluctant, spiritually and psychologically damaged, intellectuals from among our people. Mr. Page, there is still hope. You, nor his Jewish enemies can calculate what motivates him to speak so boldly and truthfully; the love he has for God and his people, not hate and bigotry. Part of his work is to expose all those who are responsible for reducing a nation of black people to savages and beast in human form. We give him our allegiance and support because he helps us improve our life, not because we need someone to blame for our plight in life. Minister Farrakhan has sixty-three years of credibility among his base because of the extent and the effect of his message and his work. His work is comparable to a modern Jesus who has the ability to open the eyes of the blind, make the deaf hear, the dumb speak and raise the mentally dead to life. As his work spreads among black people it will become as difficult to get his base to denounce him and is to get Back Christians to denounce Jesus. Anti-Semitism is foreign to the masses of our people. Black folks have enough problems to handle. They are more concerned about unemployment and raising their standard of life. It really doesn’t matter to us who likes or dislikes Jews or whites. That is only a concern of those Blacks who have been indoctrinated that Jews are the Chosen People of God, and those who benefit from money and token positions offered by Jews and whites. We are just as indifferent to Jews as we are to Arabs, Koreans, and Chinese. Why don’t you make assertions about Minister Farrakhan being anti-Arab (which is the same as anti-Semitic), anti-Korean and anti-Chinese? You have admitted that you have only been an “observer”, ‘interviewer” and “commentator” of Minister Louis Farrakhan’s remarks and controversies. Who can take you serious as a true journalist if you have not presented any facts to disprove his statements and assertions about Jewish behavior towards Blacks? Where is your research over the past three decades that proves that Minister Farrakhan is a bigot and anti-Semite worthy to be denounced by his own people? Mr. Page, if you are making such assertions about Minister Farrakhan without valid research and proof, you are a yellow journalist. Have you researched Minister Farrakhan’s “rhetoric” to verify his assertions against Jewish behavior towards Blacks? Have you read the two volumes of The Secret Relationship Between Blacks and Jews documented by Jewish historians and scholars that are the text of Minister Farrakhan’s assertions about Jewish behavior towards Blacks? Have you read the Book of Revelation in the Bible that he references his assertions about the Synagogue of Satan? All of Minister Farrakhan’s assertions about Jewish behavior have been authenticated. None of their assertions about him being a bigot or anti-Semite have been authenticated. Have you done your research on chemical marijuana and its effects on the male genitalia? Our scholars have done and authenticated the research. This is why Minister Farrakhan mentioned it in his Saviours’ Day 2017 message. Mr. Paige, it’s only marijuana smokers and lovers that have launched an emotional retort, but they have not been able to successfully challenge the authenticated scholarly research by Dr. Wesley Muhammad in his Book: Understanding the Assault on the Black Man, Black Manhood and Black Masculinity. Mr. Page, you mentioned Minister Farrakhan’s work, but you attempt to minimize his work as though it is less important than his critique of Jewish behavior. You attempt to highlight his scathing critique of Jewish behavior and reduce it to name-calling. You fail to examine the truth of his assertions about Jewish behavior towards blacks. You fail to acknowledge that some Jewish organizations have systemic structures that ill-effect not only poor blacks, but poor Americans in general. Pointing out Jewish people’s wrongs and critiquing their behavior is not anti-Semitic rhetoric. Is your critique of Minister Farrakhan for over thirty years, anti-Muslim and anti-black? I’m sure Minister Farrakhan has not said or done anything to cause harm to you or your family. Should people listen to the rhetoric spewed against Minister Farrakhan from your pen? The majority of Minister Farrakhan’s messages are for the upliftment of Black and poor and oppressed people of the planet. Are the Jewish scribes that charge Minister Farrakhan with bigotry and anti-Semitism anti-Muslim and anti-Black? Do you ever criticize the Jewish writers for unjustly attacking Minister Farrakhan, the Nation of Islam and their base? You act as though this thirty-eight-year fight between the Minister Farrakhan and some of the Jewish organizations is a one-sided, unfair assault against powerless innocent Jews. I know you are not that naïve. Minister Farrakhan is an adherent to the command in the Holy Qur’an for Muslims not to be the aggressor to anyone in words or deeds, however, we fight with those who fight with us. Minister Farrakhan did not, nor does he initiate attacks on Jews, he is responding to their attacks against him, the NOI and Black people. How do you miss that significant fact in your critiques? Why aren’t you asking Black politicians to denounce AIPAC, the Anti-Defamation League, the Jewish Defense Fund, and the Southern Poverty Law Center for their unjust attacks on Minister Louis Farrakhan and the Nation of Islam? Have you ever taken Jews to task about their scathing comments made against Minister Louis Farrakhan and other Black leaders? Are Jews above any critique or criticism at all? Perhaps, if you were not so enamored and committed to defending Jewish philanthropists and their financial contributions to control Black thought and education, you could be more conscious about some of their crimes against humanity. In conclusion, you should be truthful about the cancellation of the Chicago Women’s March that you link to Minister Farrakhan. The historic Million Man March that you mentioned in your article is the progenitor of such marches. The organizers of the Chicago Women’s March are aware of Minister Farrakhan’s success of the Million Man March. They should consult with and support him as did others who convened similar marches since the Million Man March. Consulting Minister Farrakhan on any matter will not hinder success, but secure success. Why don’t you place blame of any Chicago Women’s March organizational troubles where its rightly due, those haters of Black, Arab and Hispanic advancement; Jewish antagonists who hate and organize against anything that does not ingratiate their sickness for Jewish hegemony.